New Mamas: Sassy, small-plates eatery Meditrina dishes up restorative powers. Seeing a chef schlepping cases of beer from her car into her restaurant through the front door during dinner service is the sort of thing a critic like The New York Times’ Frank Bruni would probably be up in arms about. But to me, it just shows that at a small, independently owned establishment like Meditrina, business is often a matter of all hands on deck. 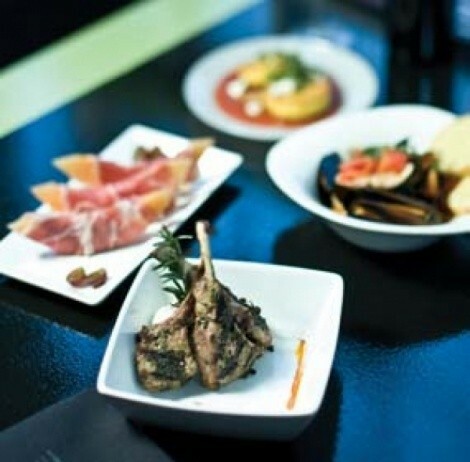 Meditrina Small Plates & Wine Bar is a petite operation where everyone pitches in and does whatever needs to be done. Chef Jennifer Gilroy (clad in sneakers cooler than Batali’s) is not above emerging from the kitchen to deliver a hot plate of patatas bravas ($5) to customers when their single server is busy handling other tables. She also plays DJ, programming the eclectic music selection that subtly sets the mood at Meditrina. Gilroy and her partner Amy Britt have created a unique, cozy, Bohemian enclave with Meditrina, and they’ll each do whatever it takes to keep their clientele happy. Judging from the number of repeat visitors to Meditrina, Gilroy and Britt seem to be making a great first impression. They did with me. Formerly Mama’s Southern Plantation—just down the street from Franklin Covey Field—Meditrina’s new mamas have an uphill battle ahead. Except during baseball season, Meditrina’s not really on the way to anywhere; it’s a destination restaurant. Arriving for an early dinner on a Monday night, I was pretty certain we’d be eating solo. But, within an hour, the place was bustling with a healthy number of busy tables, primarily populated by women enjoying each other’s company in a supportive, hassle-free environment. And although locationally challenged, what’s not to love about this offbeat eatery—an uncluttered, minimalistic space adorned with purple ceilings, jet-black tables and chairs, and a mix of exposed brick and avocado-colored walls which are hung with provocative local art. I’m happy that within weeks of opening, Meditrina dropped its “tapas” moniker and went with “small plates.” Tapas means something pretty specific to me and many who’ve lived in Spain, and while Meditrina does offer some Spanish-style tapas, the menu really is an eclectic collection of global cuisine, from shepherd’s pie to “inside-out” chicken satay. At Meditrina, you’ll likely order two or three dishes to share, depending on the size of your party, then repeat as necessary until satisfied. It’s not set up in an appetizer/entrée/dessert format. The small-plates concept lends itself beautifully to informal, unrushed, and unstructured dining—my favorite kind. So, for example, I like to start out with Meditrina’s antipasto plate ($11), a generous selection of cured meats, cheeses, olives and crusty bread. Hoard any leftover bread (although our stellar server cheerfully provided extra, gratis) because you’ll want it to soak up every last drop of the scrumptious tomato-basil-wine broth from the bowl of plump and tender steamed mussels and clams—about a half dozen of each ($9). Other classics like a whole steamed artichoke with a zippy tomato aioli, lemon and drawn butter ($8), prosciutto di Parma-wrapped melon ($9), and the roasted red pepper hummus plate ($8), are all good starters. Or finishers for that matter: No one will sneer at you here for enjoying the Granny Smith apple and arugula salad ($8) for dessert, if that’s your want. “This tastes like goat cheese,” said my beloved, referring to the crusty polenta cake ($7), topped with a bright-tasting tomato coulis, chèvre and crunchy walnuts. “Uh, chèvre is goat cheese, honey,” I replied, trying to hide a smidgeon of smirk. French has never been her forte, but she has other talents. Such as having the smarts to order the “lollipop” lamb chops ($10), which weren’t exactly “lollipop,” but sure were luscious. Lollipop chops are typically dressed so that the lamb meat is scraped toward the end of the chop, thereby making it look like a lollipop. These weren’t. But no matter, the three medium-rare grilled chops with mint were still delightful, served with Meditrina’s potentially addictive garlic-leek mashed potatoes. Those same spuds also show up as the side dish for grilled flank steak, stacked with tender asparagus ($9). The flank steak and lamb chops both worked nicely with a glass of Trapiche Oak Cask Malbec from Argentina ($8 glass/$36 bottle). Unfortunately, Meditrina falls short of being a wine bar. To my mind—notwithstanding Fleming’s 100 wines by the glass—there’s only one true wine bar in Utah and that’s Park City’s Bacchus. A selection of only 5 white wines and 10 reds by the glass (there are a few more offerings by the bottle) doesn’t put a restaurant into wine-bar territory, even with homemade sangria. And too many of the wines offered are pedestrian: Ecco Domani Pinot Grigio, Penfolds Chardonnay, Brancott Sauvignon Blanc and so on. However, I understand that a diminutive outfit like Meditrina is unlikely to have either the deep pockets or the storage space it takes to create a truly tempting wine cellar. Still, I think with a little consulting from a wine expert or two, even their small list could be turned into something adventurous. You might notice while dining at Meditrina that chef Jennifer Gilroy has a lovely “tree of life” tattoo on her arm. And I’m told the restaurant is named for Meditrina, the Roman goddess of restorative health. With so many soulless dining establishments now the norm, how refreshing it is to find an ambitious, bold, sassy, little upstart like Meditrina!